Hunting lodge on Walpole Island. I just returned from the Gathering of Nations, held at Walpole Island, Ontario, Canada. As some of you may not know, each year, all nine of the Anishnabe Nations meet at one of the Nation’s locations. The meetings rotate locations so that over a nine-year period, each Nation hosts one of The Gathering’s. This also gives everyone an opportunity to visit and see how the host Nation has been able to grow since that fateful September day in 1838 when we were forcibly removed from our lands in the Woodlands area. David Barrett in the lodge dining room. Two of our groups are recognized as a First Nations tribe in Canada. This year Walpole Island First Nation hosted us on their island. While there, they treated us to a meal at a hunting camp referred to as the Canada Camp, which we were only able to reach by pontoon boat. 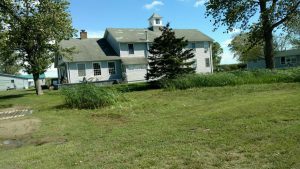 I am including several photos of the lodge on that island that is part of the five-island Walpole Island reserve. 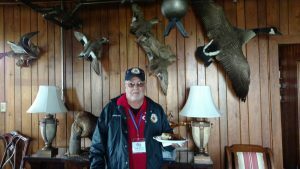 Included is one of the lodge from outside, one of the bedrooms used by hunters when used during hunting season and one of David Barret standing in the dining room, which has various mounted wild birds that were hunted on the island. Hunting, along with raising corn and soy beans, is the primary sources of income for this First Nation. While Canada has 633 First Nations, each of which suffered the same consequences as the 567 U.S. federally recognized tribes in having their land taken; Walpole Island First Nation is the only tribe that has never ceded their land. They have been able to remain in the area that historically has always been theirs. When you arrive from the U.S. by ferry, they have a very nice memorial of Tecumseh at the entrance to their government area on Tecumseh Road. A photo of that entrance is included with this article. Mrs. Capps receiveing Pokagon gift. As many of you may know, our culture involves the gift-giving. At the Gathering, each Nation presents a gift to each of the other Nations. This year, our gift to the other Nations was a very large canvas map of Turtle Island that showed all of the tribes at their historical locations in the period before the original forced removals. The map measured roughly four by six feet. I did not have an opportunity to take a picture of that map. Our Nation received numerous items, each of which is taken back to Shawnee, Oklahoma, and in time, is displayed at our Cultural Heritage Center or in our administrative building. I had the opportunity to capture a photo of the gift that was received from the Pokagon Band, which was received after the original gifting. 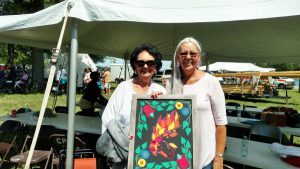 It was presented to Citizen Potawatomi Nation Vice-Chairman Linda Capps by their representative Andrea Jackson. As you can see, it is a very nice piece of art. Next year, the Gathering will be held again in early August and will be hosted by the Prairie Band tribe in Mayetta, Kansas. I urge anyone who can to attend that meeting. It will give you an opportunity to mingle and meet very distant relatives and learn about their experiences. One of the things I learned on this trip is that in Canada, the government was still taking Native children from their parents and placing them in non-Native homes for assimilation into non-Indian culture as late as the 1960s. In the U.S., that terrible policy basically ended in 1948. I bring this kind of information up not to complain, but to make you aware of the fact that our federal government, as well as Canada’s, has not been fair nor good to us and our brothers and sisters in the past. We need to make sure our future generations are aware of this and not allow it to go unchallenged in the future should the federal government try to make it policy with us or some other ethnic group again. We can’t change the past, but can move forward and insist all citizens are treated fairly and honestly. As a final note, I am again asking that you provide me your email address so I can get information out to you that will not get into the Hownikan timely enough. For example, while in Canada, I learned that the cost of national parks and federal recreational lands passes for seniors increased from $10 to $80 on Sept. 1. It is a lifetime pass for seniors over age 62 that allows the senior and the occupants of their vehicle to enter our federal parks at no charge. Unfortunately, as you are reading this article, that new charge is already in effect. I sent out an email advising everyone of this change in early August, so there was time for those eligible to look into getting the pass at the $10 rate. In closing for this month, I thank each you for placing your trust in me to represent District 3. I am very proud of the honor. If you have a question or feel that I may assist you in some way, please give me a call or write. My contacts are below.